With help from the fine people at Google, we have incorporated a search tool into the main entry page of the Mafiahistory.us website. 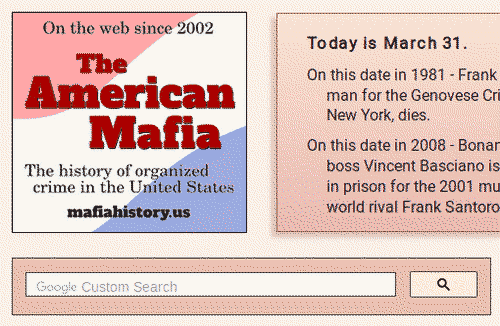 The tool will search for relevant articles on Mafiahistory.us and related sites (including Writersofwrongs.com and Buffalomob.com). We hope that this will guide visitors to items of interest to them and prevent them from getting lost in the hundreds of pages on these sites. We would be happy to receive feedback from visitors regarding this new addition to the website.